▶Fully support Data Syncing and Battery Charging for iPhone devices. ▶The cord should never malfunction or stop working, but on the rare occasion it does you are covered by an unconditional warranty. ▶Well-built cords, no more worries about cords getting snapped or broken. ▶iPhone 7 / 7 Plus / 6s Plus / 6s / 6 Plus / 6 / SE / 5s / 5c / 5, iPad Pro / Air / Air 2, iPod and so on. 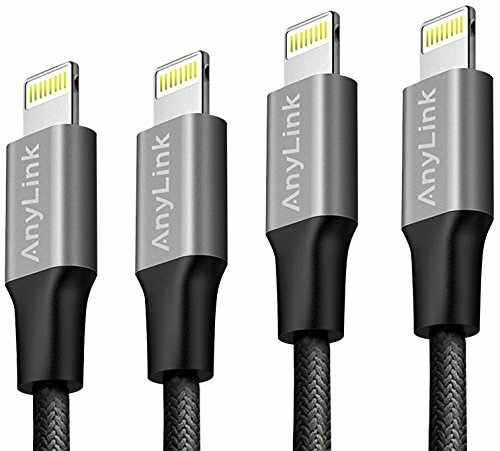 【ENHANCED QUALITY AND SAFETY】Premium quality nylon-covered lightning cable, faster charging and syncing, built-in chipset ensures the safety for lightning devices. 【DIFFERENT LENGTHS FOR DIFFERENT NEEDS】Different lengths combination meets all your demands in daily life and makes your life more convenient. 【PERFECT COMPATIBILITY CHARGING CORD】Complete charge and sync compatibility with iPhone 7 / 7 Plus / 6s Plus / 6s / 6 Plus / 6 / SE / 5s / 5c / 5, iPad Pro / Air / Air 2, iPod. 【GREAT CHARGING & SYNC】High-quality four-core copper wires ensures high speed charging & data transferring, saving much of time to re-full power to your devices. If you have any questions about this product by AnyLink, contact us by completing and submitting the form below. If you are looking for a specif part number, please include it with your message.